CAMBRIDGE, Mass. (JTA) — Harvard University Jewish students take note: You may want to be on your best behavior during High Holiday services. 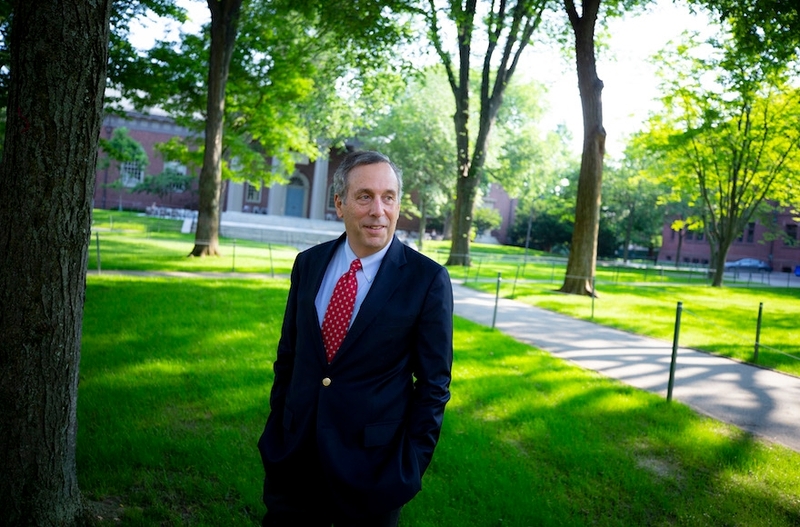 Lawrence Bacow, who began his new position as the Harvard president on July 1, and his wife, Adele Fleet Bacow, plan to spend some of the High Holidays at religious services at the Ivy League school’s Hillel. The Jewish couple met on the campus more than 40 years ago, when Bacow began Harvard Law School, he recalled. Attending student services was a habit he picked up in his previous job, president of Tufts University, a nearby Boston-area school. Bacow, 67, said he intends to draw on that identity and tradition in restoring faith in higher education, a field under scrutiny for its enormous price tags and perceptions of elitism and political bias. He is concerned about affordability, and that the value of higher education is now questioned among parents and the broader public. “These are tough times for higher education,” Bacow acknowledged in the conversation with JTA. Bacow, a longtime advocate for public higher education, intends to use his new high-profile leadership position to impart the “enduring values of colleges as enablers of the American dream,” citing himself as a good example. As the son of immigrants who had nothing when they arrived in this country, he credited higher education with allowing him to succeed. Bacow wants to ensure that opportunity is available to future generations — and now he has a national platform to address the subject. “I really see this in many respects as a call to public service,” he said, and not just a chance to lead Harvard. Appointed in February as Harvard’s 29th president, Bacow succeeds Drew Gilpin Faust, the college’s first woman president, who stepped down in June after serving 11 years. He is the school’s third Jewish president, preceded by Neil Rudenstine (1991-2001) and Lawrence Summers (2001-2006). Bacow, a graduate of the Massachusetts Institute of Technology, graduated from Harvard Law and also earned his doctorate from Harvard, in public policy. He’s an economist and a specialist in environmental policy. After 24 years at MIT, where he taught and served in senior leadership positions, Bacow became president of Tufts. In his decade there, he was credited with transforming the liberal arts school into one with a competitive global presence and expanding accessibility for students from families with low and modest incomes. Following Tufts, he was a senior scholar at the Harvard Graduate School of Education and at its Kennedy School of Government. Born and raised in Pontiac, Michigan, Bacow grew up in a family deeply engaged in Jewish life. His father, Mitchell, who died in 2007, was a refugee who fled pogroms in Eastern Europe. His German-born mother, Ruth, who died in 1994, was a Holocaust survivor — the lone Jewish survivor from her town. Bacow, a warm and engaging conversationalist, spoke openly about their poignant life stories and the influence it continues to play in his personal life and profession. His mother was beloved for her sunny disposition and was a strong woman, he recalled. Bacow said his parents instilled in him and his sister a sense of gratitude and a responsibility to share their good fortune. At one time his family belonged to the city’s two congregations, Bacow said with a chuckle. “Life revolved around the synagogue,” he said, where he recalled spending four or five days each week, in Hebrew school and religious services. It’s a tradition he has carried throughout his life. The Bacows are regular Saturday morning minyan goers at Temple Emanuel, a Conservative congregation in Newton, the Boston suburb where they raised their now-grown sons. Bacow served for a time on the Hebrew College board in Newton Centre and in 2004 received an honorary degree from there. In a speech at the commencement, he challenged the notion that anti-Semitism was rampant on American college campuses, calling it a “gross distortion,” as described in a recent Harvard Magazine profile. A critic of petitions on colleges to divest from Israel, including one at Tufts, Bacow nonetheless cautioned in his address that labeling boycott proponents anti-Semitic shuts down conversation. He recommended viewing such disputes as a teachable moment. Debate is healthy, he believes. Over the years, he has shared his expertise with several Hebrew College presidents, including Rabbi Daniel Lehmann, whose presidency did not overlap with Bacow’s time on the board. With that school weighed down by debt, Bacow was generous in offering guidance on a range of issues, from attracting new sources of revenue to expanding student enrollment, Lehmann told JTA in a phone conversation. Bacow’s staunch belief in a richly diverse undergraduate experience is being challenged in a high-profile federal lawsuit brought against Harvard by Students for Fair Admissions asserting that the school’s admissions policies discriminate against Asian-American students. It’s a claim the school and Bacow deny. The case is expected to be heard beginning in October. Harvard attracts more than 40,000 applicants each year and accepts only a small portion, Bacow said. But he said the school embraces diversity in its admissions — from academic and extracurricular interests to geography — to enhance the experience of its students. He is familiar with those who compare the claims about Asian-American admissions to the quotas used against Jews applying to Harvard and other colleges in the 1930s and 1940s.